Actor turned politician Rajinikanth, in a tweet, said that Karunanidhi's day of death is an "unforgettable black day in my life". From veterans to young talent, from the southern movie world to the Hindi film industry, people were united in mourning the death of the litterateur, whose movies like "Parasakthi", "Panam" and "Thangarathnam" were among those that espoused the ideologies of the Dravidian movement. Writer-director Koratala Siva tweeted: "A long meaningful journey comes to an end. Rest in peace Kalaignar. I join the people of Tamil Nadu in mourning the demise of the senior most leader M. Karunanidhi." As a major controversy erupted on Tuesday night after the Tamil Nadu government declined DMK's request to allot space for burying the mortal remains of Karunanidhi near party founder C.N. Annadurai's memorial at the Marina Beach, actor Siddharth urged the people to keep petty politics out of the matter. "The last Tamil titan has fallen. Former Tamil Nadu Chief Minister M. Karunanidhi was an incomparable man. TamilNadu has lost at once its greatest contemporary political and creative enigma. "Our beautiful language Tamil will miss Kalaignar Karunanidhi. This void he has left will take ages to fill," Siddharth wrote. He urged the state government to "make it the last Marina memorial". "Have some respect and be responsible. This is not the time to play petty politics." Actress Nagma said his passing away is an irreparable loss to the nation. "He lead the Dravidian movement wth a lot of personal integrity and provided social cohesion to the Tamilian cause through his far-sighted leadership and administrative skills." Actor-politician Shatrughan Sinha said "India has lost a prominent, distinguished leader of the masses, Kalaignar". "His contribution to cinema and politics is impressive and he shall continue to remain in our hearts." Actress Samantha Akkineni said Karunanidhi's death marked "the end of an era". "Over six decades. Did the impossible. Will forever be remembered," Samantha wrote of his unstinted dedication to his state and the country. Actor-producer Nivin Pauly called him a "strong leader, a great writer and a simple human being", while Telugu film actor Manoj Kumar Manchu wrote: "Respect to Karunanidhi Garu and his contribution to the state and Tamil literature". For composer G.V. Prakash Kumar, Karunanidhi's death has marked the end of "an era of politics, an era of leadership, and an era of writing". Actor Riteish Deshmukh, son of late Maharashtra Chief Minister Vilasrao Deshmukh, wrote: "Today, India has lost one of its tallest leaders. Deeply saddened by the passing away of Kalaignar Karunanidhiji. "His contribution to the state of Tamil Nadu, its people has been immense. True champion of Tamil pride. RIP Sir." Young actress Priya Prakash Varrier wrote: "The Son of the Sun has set, never to rise again....RIP Kalaignar." Actress Hansika called him "one of the best leaders the country has ever witnessed". "I hope God gives courage and hope to the family member and fellow Tamilians to cope with this huge loss," she added. Singer-composer Adnan Sami too extended heartfelt condolences, saying Karunanidhi was a giant. 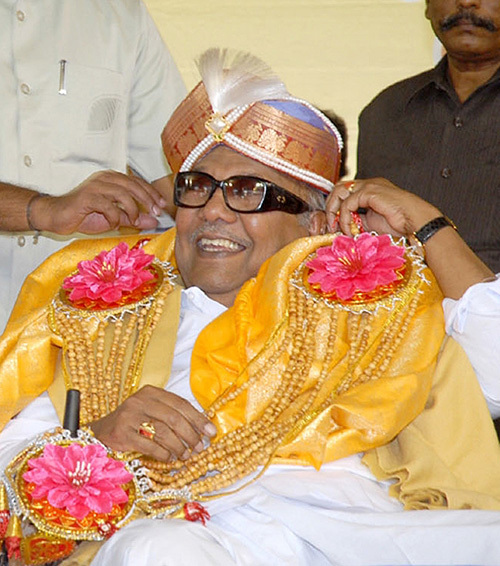 Popular actor R. Madhavan described Karunanidhi as the "most dynamic leader".